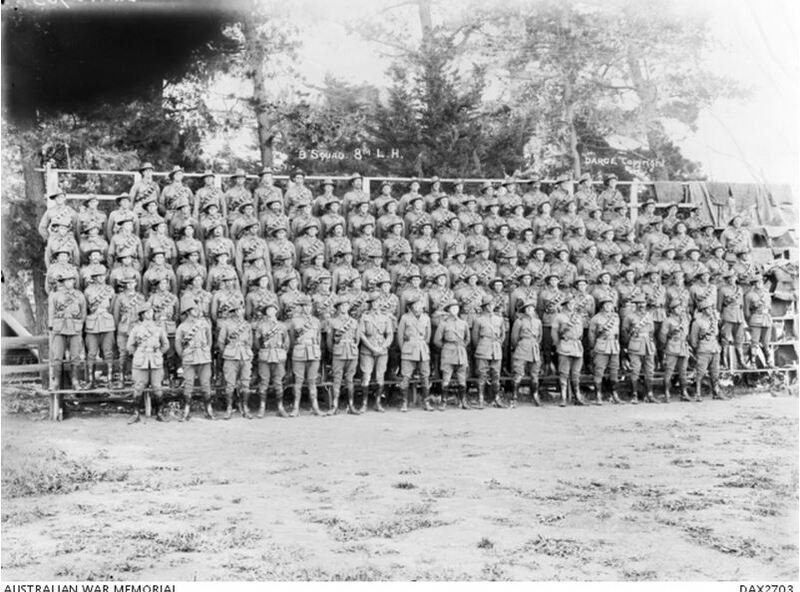 The AIF’s 8th Light Horse Regiment (LHR) formed in September 1914, had among its ranks many Western District men. It was for that reason I was recently contacted by Dean Noske who is currently researching the 8th LHR, in particular, B Squadron. 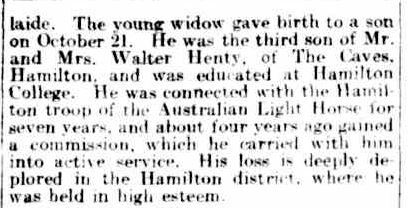 As I’m familiar with the 8th LHR, mostly due to the involvement of Edward Ellis Henty of The Caves Hamilton, grandson of Stephen G. Henty, I was keen to help Dean reach out to family members of the Western District men. The following photo has been a favourite of mine, found among the Australian War Memorial‘s collection. Pictured are four Western District officers of the 8th LHR, Lieutenants Edward Ellis Henty, Eliot Gratton Wilson, Robert Ernest Baker and Major Thomas Redford. 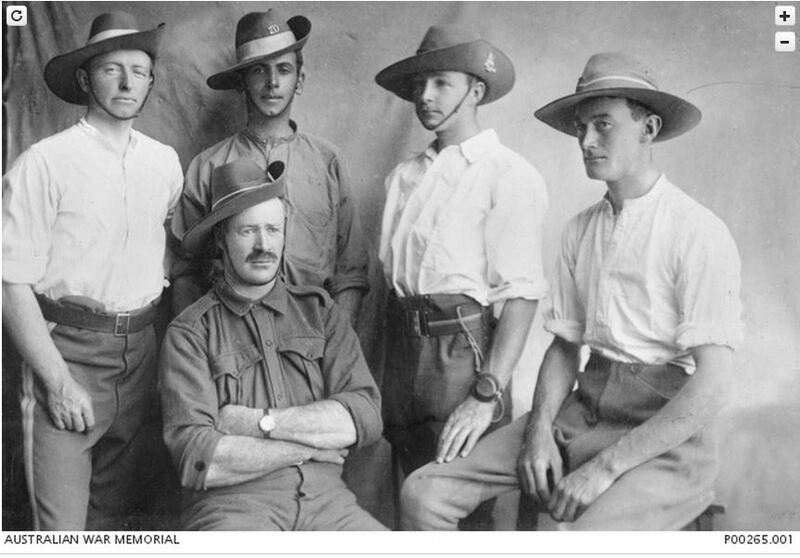 Also joining them in the photo was Lieutenant Borthwick of Melbourne. 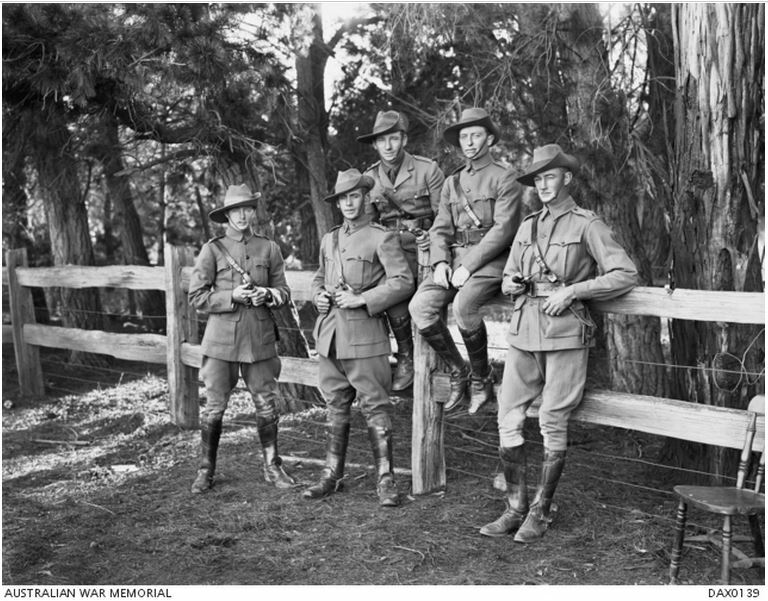 The relaxed nature of their poses and uniforms, the mateship and the babyface of Eliot Wilson have intrigued me since I first saw it. A photograph in full uniform was also taken, depicting three of the Western District officers again with Lt.Borthwick and an unidentified man. Those four Western District officers and the soldiers listed below are those Dean is seeking help with. If you are able to offer Dean any assistance by way of photographs, letters or stories, please contact him at dean.noske@gmail.com Any assistance would be greatly appreciated. All names were sourced from the 8th Light Horse Regiment B Squadron Embarkation Roll and Hamilton’s WW1. “THOSE WHO HAVE DIED FOR FREEDOM’S CAUSE.” Bendigo Advertiser (Vic. : 1855 – 1918) 2 Sep 1915: 2. Web. 29 Jan 2015 <http://nla.gov.au/nla.news-article91091398&gt;. 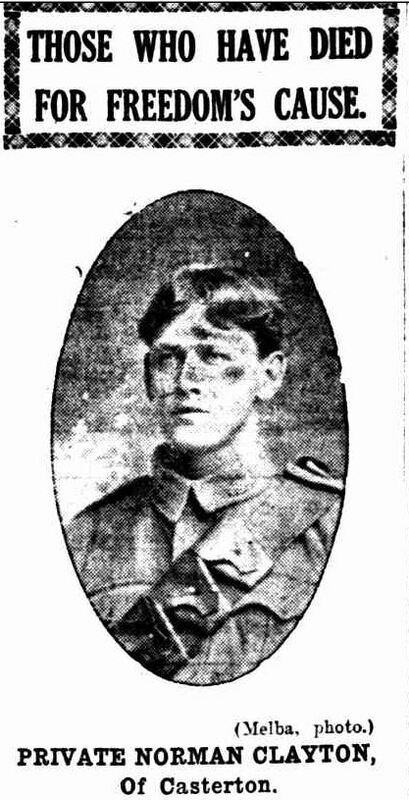 “ROLL OF HONOUR.” The Argus (Melbourne, Vic. : 1848 – 1957) 17 Sep 1915: 6. Web. 29 Jan 2015 <http://nla.gov.au/nla.news-article1561135&gt;. 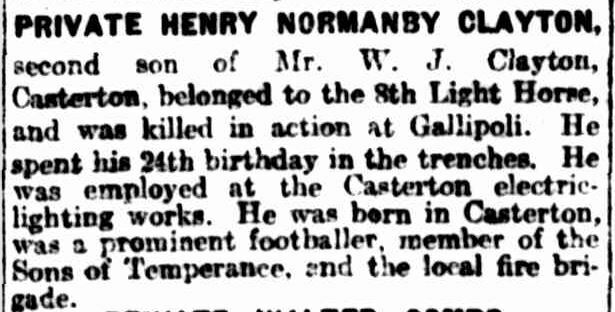 “ROLL OF HONOUR.” The Argus (Melbourne, Vic. : 1848 – 1957) 27 Oct 1915: 7. Web. 29 Jan 2015 <http://nla.gov.au/nla.news-article1575352&gt;. “WARRNAMBOOL HEROES.” Warrnambool Standard (Vic. : 1914 – 1918) 7 Sep 1915: 3 Edition: DAILY.. Web. 29 Jan 2015 <http://nla.gov.au/nla.news-article73458334&gt;. 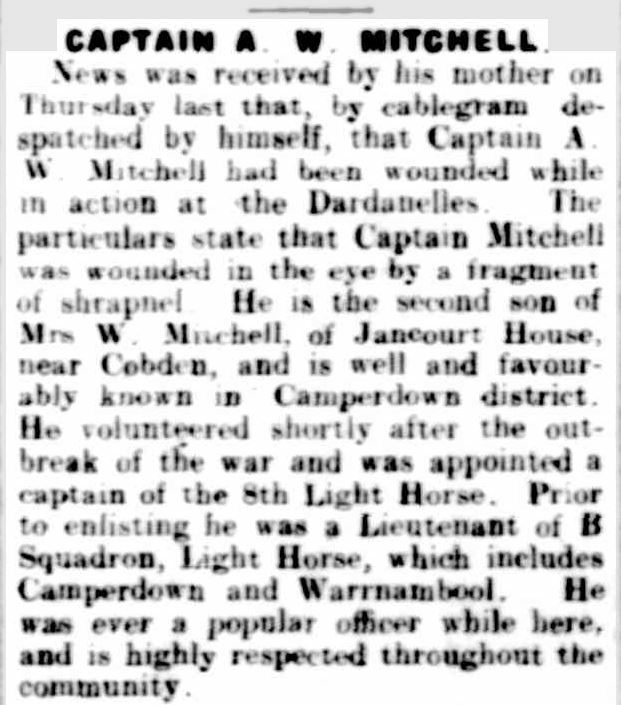 “CAPTAIN A. W. MITCHELL.” Camperdown Chronicle (Vic. : 1877 – 1954) 8 Jul 1915: 3. Web. 29 Jan 2015 <http://nla.gov.au/nla.news-article22979740&gt;. 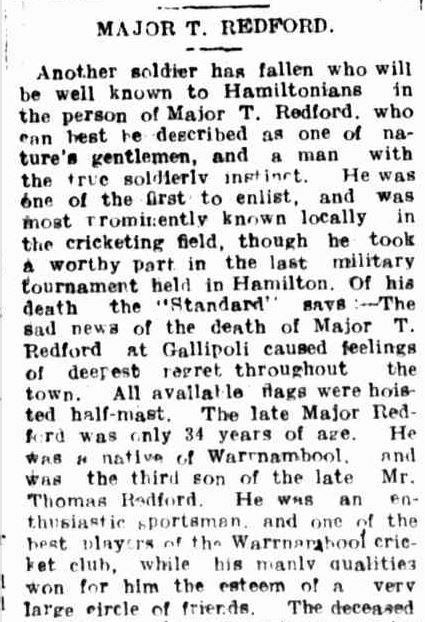 “MAJOR T. REDFORD.” Hamilton Spectator (Vic. : 1914 – 1918) 23 Aug 1915: 4. Web. 29 Jan 2015 <http://nla.gov.au/nla.news-article120398693&gt;.